It's that time again in the southern division of Manitoba, fishing season is open! The weather leading up to Saturday May 9th was all over the charts, from highs of 25 Celsius to a cold front moving in the last 2 days leading up. The morning brought cool temperatures and winds from the north and I was prepared with many layers, my last being winter ice fishing gear. We had the boat and our gear loaded up the night before and after 3 hours of sleep we were on the road to the Whitemud River. The air had more of a cool fall feel to it than fresh spring scents and the excitement that had been building for days had settled into a rust shaking concentration. 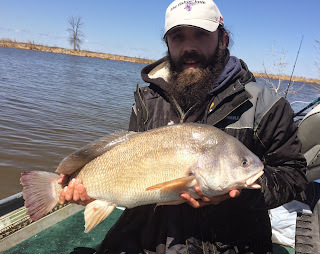 We saw our first pelican and a Red tailed Hawk on the way to our next trolling location as I tied on a Berkley Flicker Shad to see if the rattle and vibration could help lure a walleye or freshwater drum to strike. It wasn't long into our second troll where I connected and the fight was on, up to the boat came a 16 inch drum. 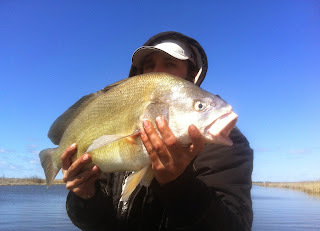 We continued to troll and Jay landed one of similar size and shape, followed by me hooking in to what I initially thought was a log until I felt the head shakes reverberate through my fishing line. After around 90 seconds of battle it was close to the surface of this muddy river, but before we could get a glimpse the lure was spit and the fish gone. Disappointed sure, but there were plenty of hours left in the day to keep trying. We pushed on trolling, covering a lot of ground with few bites. Many deeper pockets were noticed on the depth finder so we picked one that coincidently provided shelter from the wind and tied ourselves to shore. The fish were there, we just had to wait and see if they would bite. The action was steady but not hot and heavy, many bites were peckish and hesitant while others would out right slam the bait. Lots of species call this river home or at least use it for part of a season, so the chance for multiple species is good. I had walleye and drum on my mind and it was clear the carp were out and about too as we saw many breach in the shallows. My first drum of this spot bottom fishing came up right at 24 inches and it was after that I changed over to a medium heavy rod with heavier line. I had Drumzilla on my mind now and wanted as much of an upper hand as I could have in the situation. This meant less sensitivity but I was willing to give that up if it meant a quicker fight and release of these pre spawn egg laden beasts. Bait bottom fished was out producing any lure we tried however casting jigs we were able to read the bottom feeling rocks and sunken trees as well as weed patches. The bite eventually slowed down but not after a few good handfuls of fish were caught and released, so we decided to head off in pursuit of a new section. As we putted along an occasional American Bittern would spook out of the tall grasses and dried bulrushes, we would see many throughout the day along with countless ducks, birds of prey and the occasional heron. The sun had finally shown itself and it looked like we were due to get some warmth with clear skies in the north. We found an area of shore with a downed tree to tie to and got back to fishing. 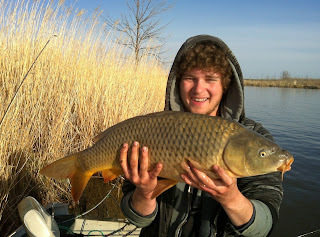 After a few 15 - 20 inch drum were landed between us and many missed hooksets, a pair of medium sized carp were landed by Frodo. Bringing the species count up. 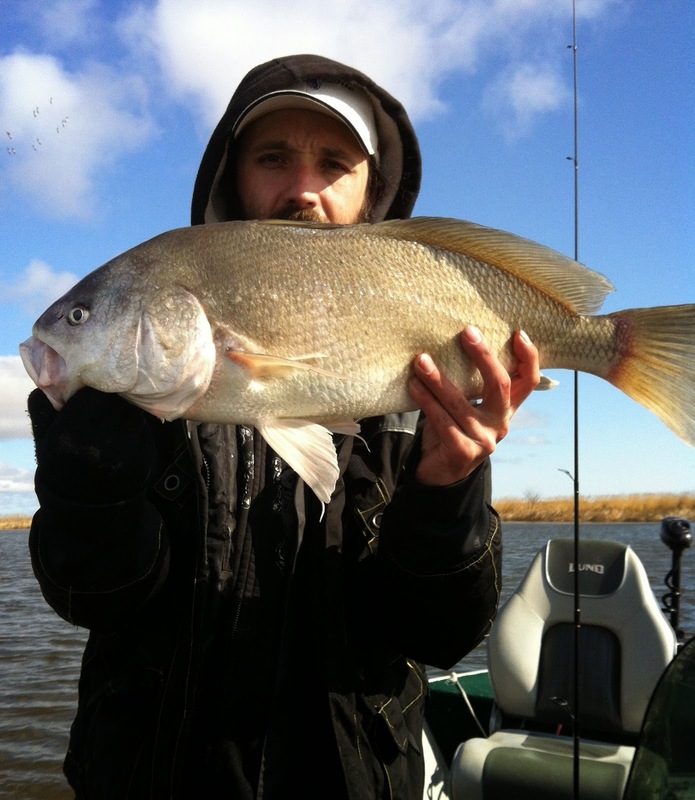 Over the next 90 minutes there were a few standout drum caught. I wasn't quite able to top my personal best, but the quality did not disappoint. Most of the boats we saw out were trolling and not having much luck by the sounds of things. Occasionally someone would yell at us "Any Pickerel?" 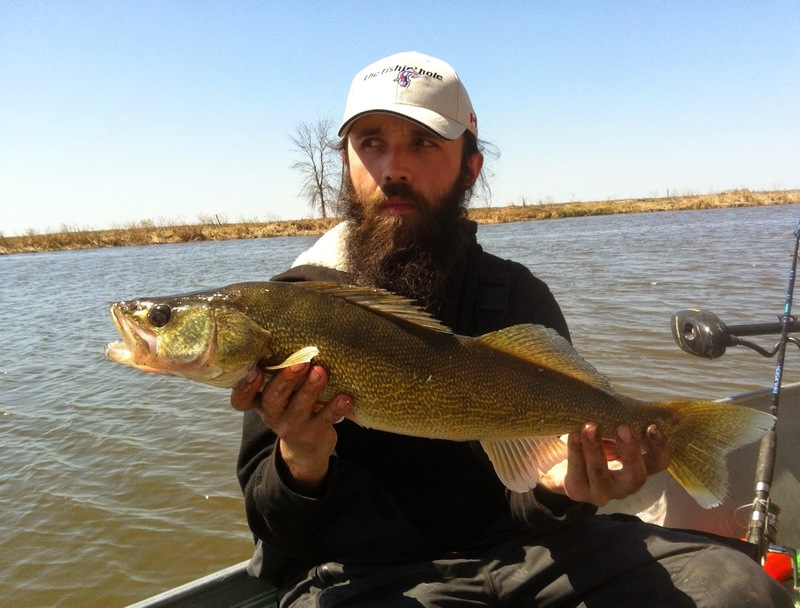 It's what so many Manitobans call walleye and we hadn't landed one yet. After catching and releasing a nice 27.5 inch drum I was able to shed my winter layer and re-bait my hook. The next fish would bring up the species count again. With my line tight I felt the bang of a hit on my shrimp and slammed the hook home. Right off the hop there were many more headshakes than a drum normally put out. Once near the surface we saw it was a walleye and a good one at that. It peeled off down below the boat and the next time up, into the oversized net it went. We were able to keep it in the water for hook removal and as we were about to lift it out for pictures two boats, one from the south and one the north came trolling around our point. After some quick pics for memory sake (my eyes tell a funny story), the walleye was gently placed back in the water ( to the shock of the people in the 2 boats ). We didn't take the time to measure it as I knew it wasn't a personal best and we also knew it was larger than ones we enjoy eating. After a few more drum and a lull in the action we ended up pushing to the mouth of the river where it flows into lake Manitoba. 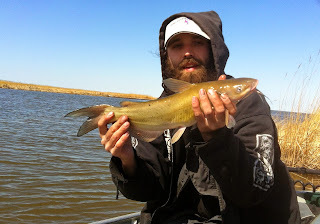 There we caught bullheads, juvenile channel catfish along with a handful of drum. I had something almost spool all the line off my reel only to turn around and head back the other way. I reeled as fast as I could once again feeling tension only to have the fish charge up towards the surface of the water and the line go slack again. A real bruiser, what ever it was. We finished the day listening to one of many American Bitterns calling out for a mate. Simply prehistoric is the only way I could describe those birds. 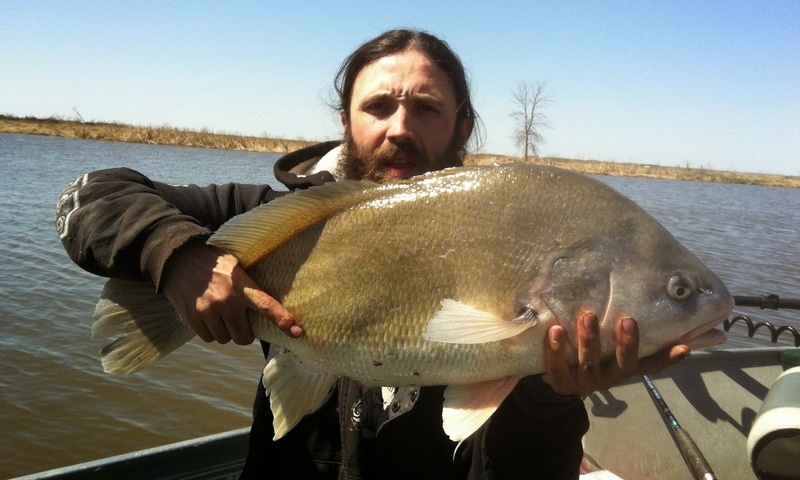 This link has a great audio sample of their call >>> https://www.youtube.com/watch?v=bAxAEoAVmuc We caught a handful of drum and Frodo a few common carp on a hair rig, with the biggest of those 29 inches. They fought hard and smart heading for sunken logs and cover providing lots of entertainment and challenges. The weather was better than expected and we were each a little sunburned. With a long drive home and what had been an early start to our day we headed to the dock. A quick and easy load up and we were on the road before sundown, home after dark content with the days events.